Vladimir Makovsky is considered to be one of the best masters of the description of domestic scenes, the transfer of mood and characters. Realism plays a large role in his works, sometimes it seems to the viewer that he directly becomes a participant in the events depicted. The exact transfer by the artist of all the little things in clothing, decoration, decoration takes us into the past, forcing along with the characters of the paintings to relive the situations conceived by Vladimir Egorovitch. One of these paintings is the “First Coat”. On it, the artist depicted a young man dressed in a new coat. It happens in a small room; near the newly-made dandy gathered all the households. The clumsy figure of a young man shows that he wore a tail coat for the first time in his life: he slouches, for some reason, he spread his elbows to the sides. It is clear from his face that he is impatient to hear an opinion about his new suit of his relatives, who are staring at the new thing. Next to the main character of the picture is his grandmother. Lifting her glasses, she examines the thin fabric of her jacket with the appearance of an expert, apparently assessing her quality. On the left is a young woman who looks at the young man with affection, her smile reads approval and delight, it is clear that she likes the new suit. Even a young maid is interested in looking at a young handsome gentleman, trying not to betray her emotions, she covered herself with her hand. But the look of the young gentleman is addressed to a woman dressed in a black dress. This is probably his mother and her opinion is really important for the young man. But her face does not show delight and joy, only some tired thoughtfulness. What internal doubts torment her? 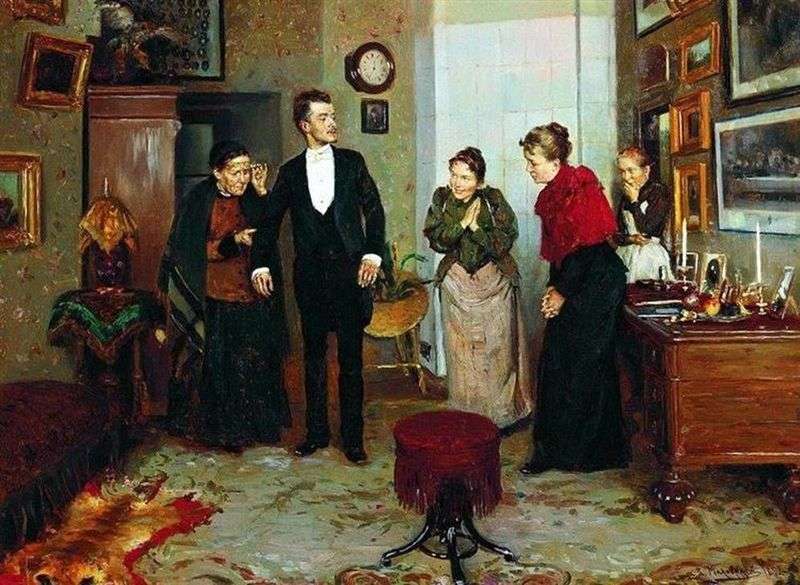 Carefully, to the smallest details, Makovsky depicted the room in which the action takes place – this is the typical room of a noble house of that time. Most likely, the main character of the canvas lives in this room. In the room you can see a large wardrobe, an ottoman, a solid desk for work. There are many paintings on the walls, apparently the young man is a fan of art, or maybe it’s just a tribute to fashion. White tile stove at the central wall – a bright element of the picture. It reflects a lot of sunlight, because of this the canvas becomes not so dark. The technique used by the artist in writing the canvas is interesting – the viewer is watching the scene as if through a window, this makes it possible to immerse into the atmosphere of Vladimir Makovsky’s painting “The First Coat” as much as possible. Description and meaning of the painting The first coat by Vladimir Makovsky.